Kruger Marula Trees – they conceal interesting things within their branches! 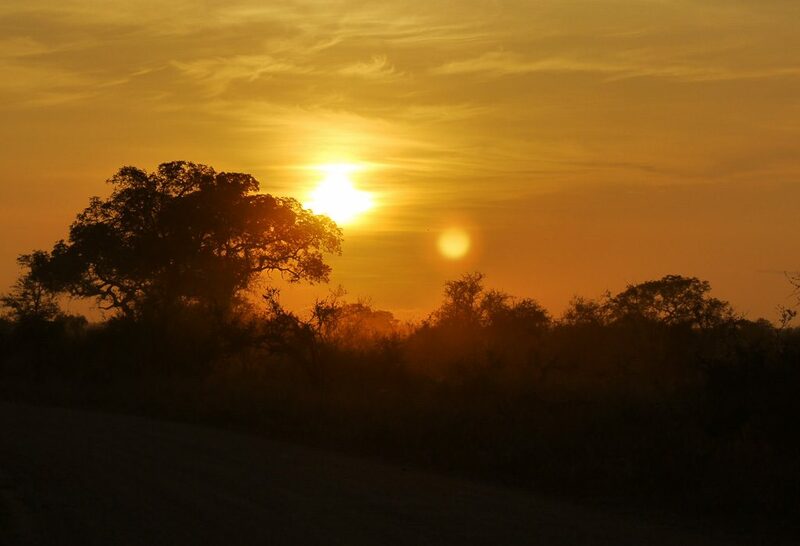 Posted August 1, 2018 by Robyn & filed under Behind the scenes, General News, Stories from the Bushveld. We left camp early, just as the gates opened. It was the middle of summer and the bush was thick with the splendor and sparkle of early morning , bathed in the fiery orange glow of daybreak. We made our way slowly along, encountering hyena and plenty of general game as we went. Looking forward to getting off the tar road and onto the quiet little dust road a short distance on. We had been bumbling along the little dirt track for about 7kms when we came across a lone elephant bull grazing peacefully within a cluster of foliage. The foliage was quite thick however, so it didn’t take long for my eyes to wander… always scanning, that’s me. 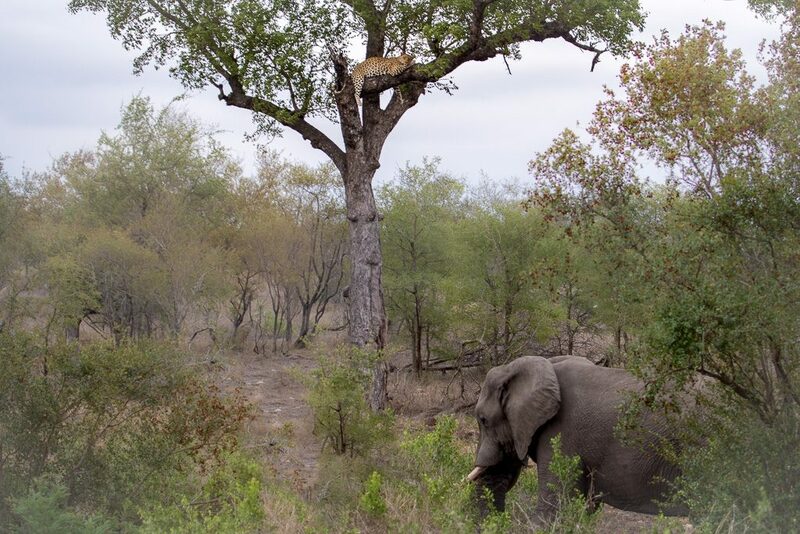 There was a tall Marula tree to the back of the ellie. There was something unusual about it and I just had a feeling. I was quite confident in what I thought I saw. That being said, one never drops the “L” bomb without absolute certainty. Reaching for the bino’s , adjusting the focus… YES! 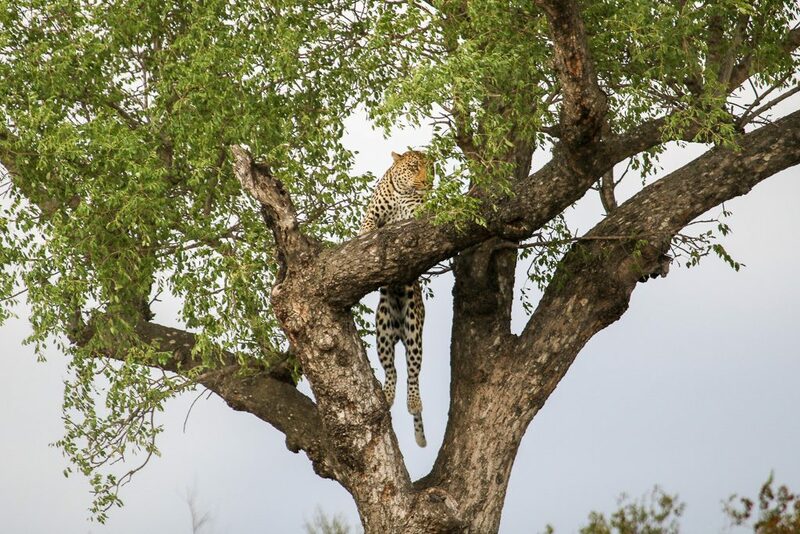 A beautiful leopard, right there, perched in the fork of the Marula tree- how exciting! The leopard was certainly not bothered by our presence. He stared straight at us for a few special moments, then focused his attention on the veld below, checking that all was in order in his territory. At one point I’m pretty sure I recognized a brief hint of surprise on his face, something along the lines of… “aaah yes, there’s an elephant down there, fancy that”. 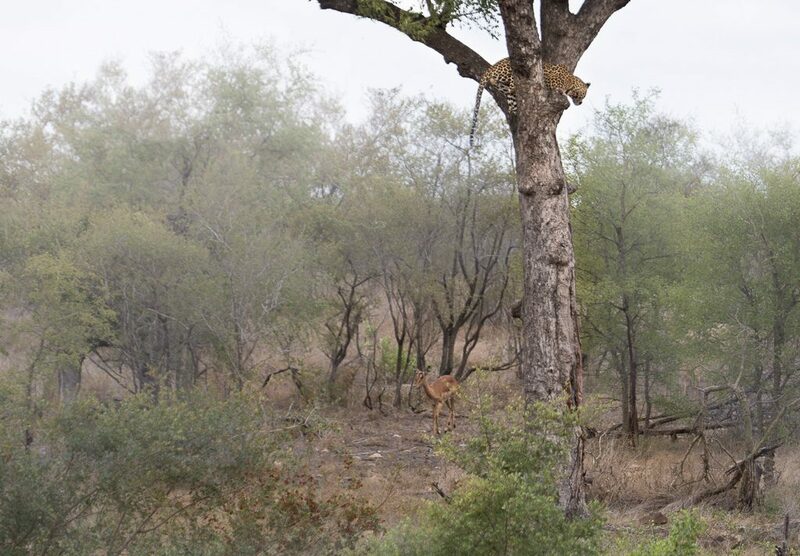 Anyway, the leopard remained in the fork of the tree for a couple of minutes. We positioned the vehicle just so, procuring a lovely view of the handsome fellow, positioned snugly in the fork of the towering Marula. He then began to adjust his position. 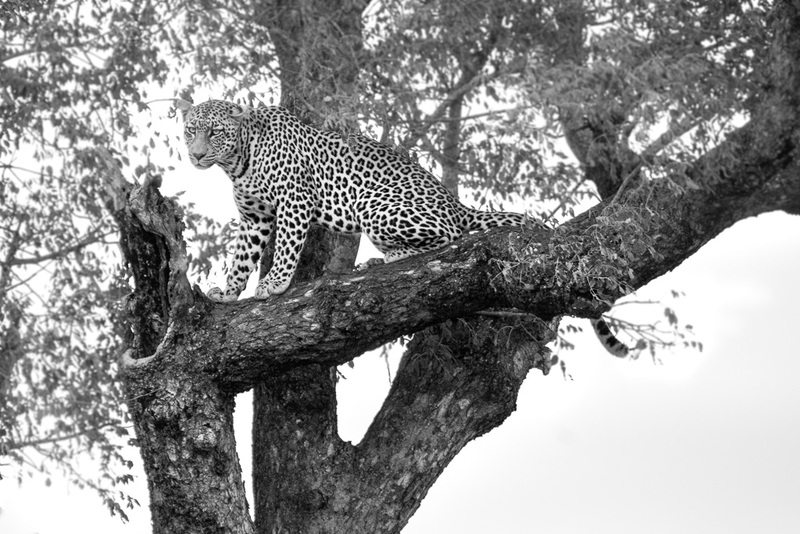 We were delighted to see him stretch up for the branch above his head, lifting himself with one impressively swift leopard pull-up. The good old elephant was not up to much, still with his head stuck in the shrubbery on which he was munching. The leopard obviously deemed an obscured view of an elephant bum not very noteworthy and proceeded to make himself comfortable, draping himself over the thick of a Marula branch. We were very lucky to have had the sighting all to ourselves up until then. A second car with two very enthusiastic (but well behave) tourists then arrived. 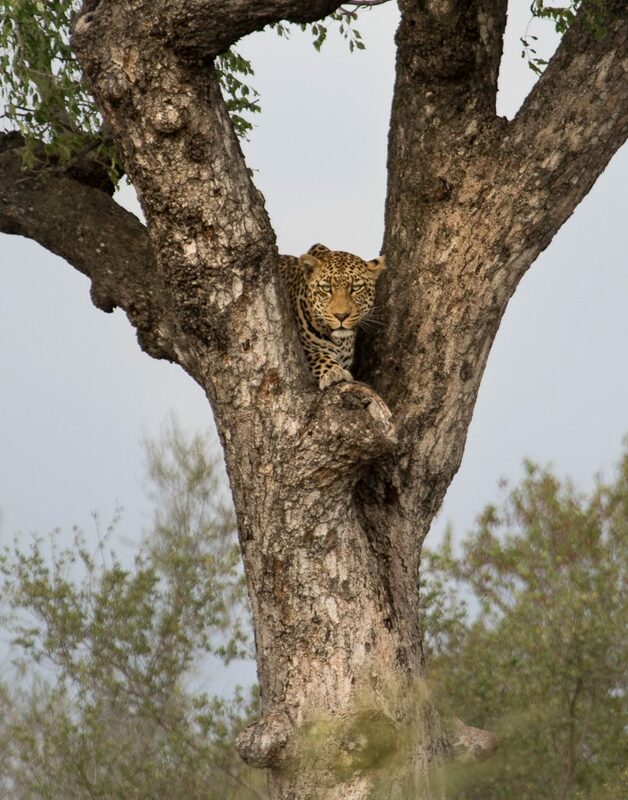 Luckily the leopard didn’t seem to deem them very noteworthy either, continuing to relax on the branch, closing his eyes every now and again in true “cat nap” style. At this point, the elephant had obviously munched as much as he wanted to munch from his little patch of thicket, and he decided it was time to head forth in pursuit of something new to delight the pallet. I was having trouble with the SD card in my camera at the time. Using a camera I was unfamiliar with I fell prey to classic rookie error, discovering early in the morning that the card was full. Only being able to obtain a new one once back at camp, I was trying to delete the less interesting images to keep as much space as possible available in the meantime. 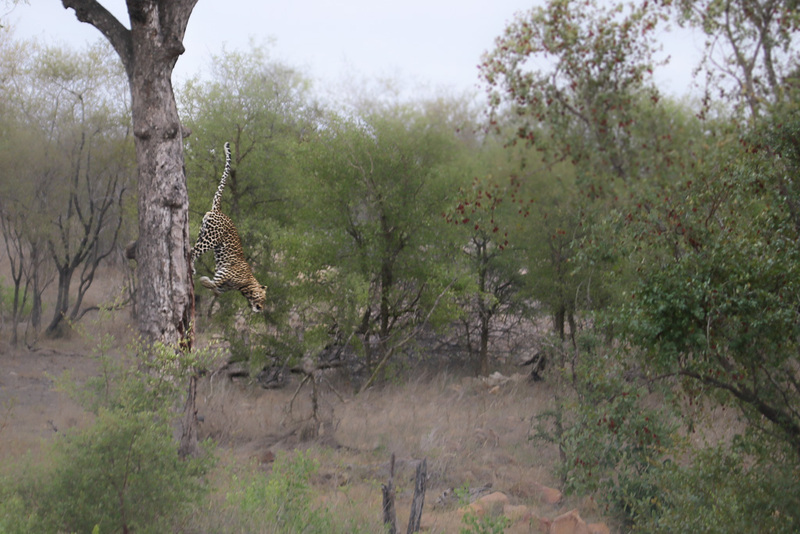 A very frustrating thing to try do whilst in the midst of a fabulous leopard sighting. Anyway, I was trying to use the camera space sparingly instead of clicking away with reckless abandon as I usually would. Knowing you have a very small window to catch a specific shot, having your camera tell you there is no space for new images and subsequently having to try delete images whilst making sure you don’t delete any of your best images by mistake- that’s very frustrating indeed. I didn’t capture the scene as I would have liked to (from a timing aspect), but I’m so pleased I was able to capture both animals in the same frame. I must say, neither creature was perturbed by the other’s presence, not in the slightest. The leopard carried on snoozing and the elephant, well I’m not sure he even noticed there was a leopard above his head in the first place. 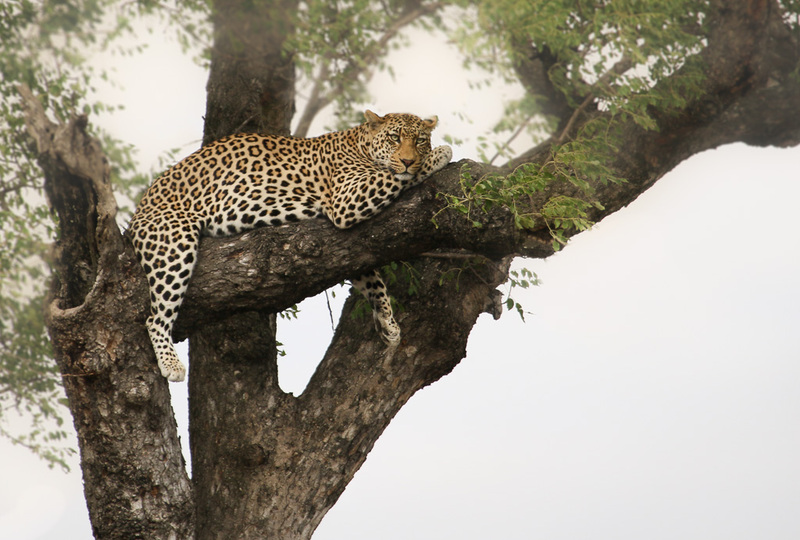 After a bit of a relax the leopard suddenly sat up on the branch. It was evident that something had caught his attention but there was no sign of what that fabled something might be. He wasn’t fixated on any specific location or direction really. It was more as if he’d sensed something, a faint sound or far off scent bringing news of things to come perhaps. Occasionally he would glance back at us, a curious look on his face that seemed to say, “uh… did you hear that too”?? “See anything then”?? A few minutes passed with not much happening. Suddenly, he was intensely alert, spinning around on his branch, eyes fixed on the thickets below. We caught our breath when we saw a young impala emerge from the bush. There It was, strolling down a little game path, in a very nonchalant manner. I think there were a few moments when we were quite certain we were going to witness a devastatingly dramatic display of aerial surprise attack ballet. 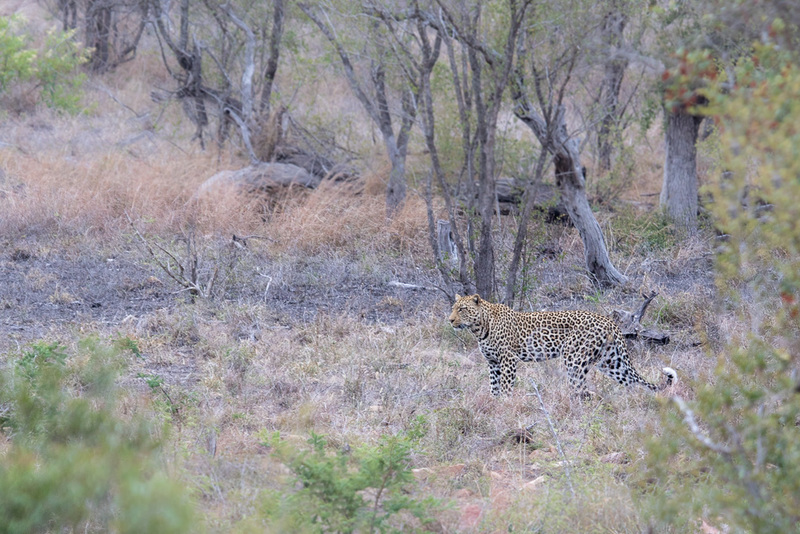 Watching the scene with baited breath, we then noticed the leopard’s body relax. His stance morphing from business mode to something slightly more casual, and then finally taking on a form of curiosity as he peered down from around the thick of the Marula trunk. The impala carried on strolling, none the wiser to the formidable set of jaws and claws sitting pretty just a few meters above its head… ignorance truly is bliss. By this stage the first vehicle that had joined us on the sighting had moved on. It had however been replaced by two more vehicles. I’m not sure if it was the increasing number of vehicles or just the fact that the leopard felt that he’d spent sufficient time up his Marula and there were now other areas of his territory which required his inspection. He leapt forth from his arboreal haven to the land below. The leopard didn’t seem to be in a hurry to go get anywhere fast. He sat for a few moments and it was then that I recall seeing one spotted body becoming two spotted bodies. 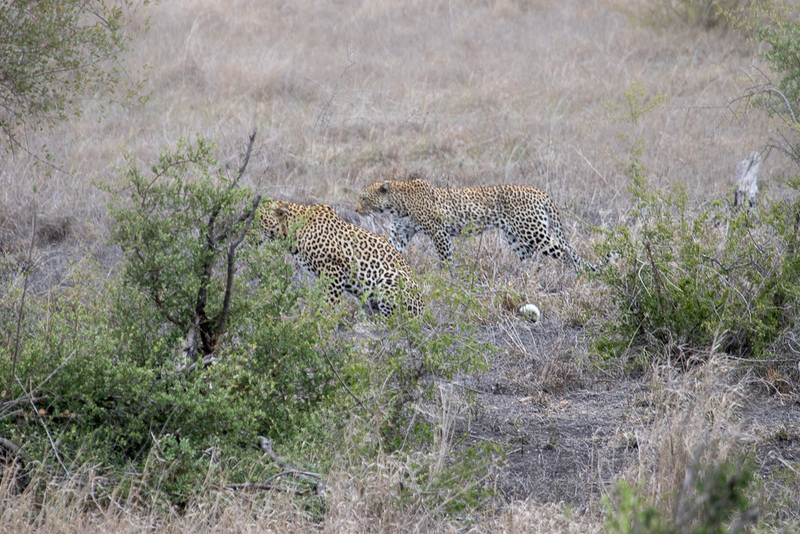 There was a brief period of contemplation which lead to the realization that there were in fact TWO leopards . This was quite an exciting revelation. The whole time we’d been on the scene we’d had absolutely no inclination that there was a second leopard resting somewhere in the veld below. The leopards were now on the move. A combination of limited space on the SD card and less than favourable terrain made for a pretty lousy photo of the pair together. I can assure you that in real life, both leopards had heads. Anyway, we positioned the vehicle in attempts to get a clearer view of said spotties. They had decided to rest, flopping down “flat-cat” style in the grass a short distance apart from one another. The visual was not perfect and the vehicles were now beginning to accumulate. Quite satisfied with what we’d already been lucky enough to witness, and with the call of morning tea ringing loud and clear, we decided to move on. We passed the good old elephant a short distance up the road and thanked him for stopping us , just at the right place at the right time. 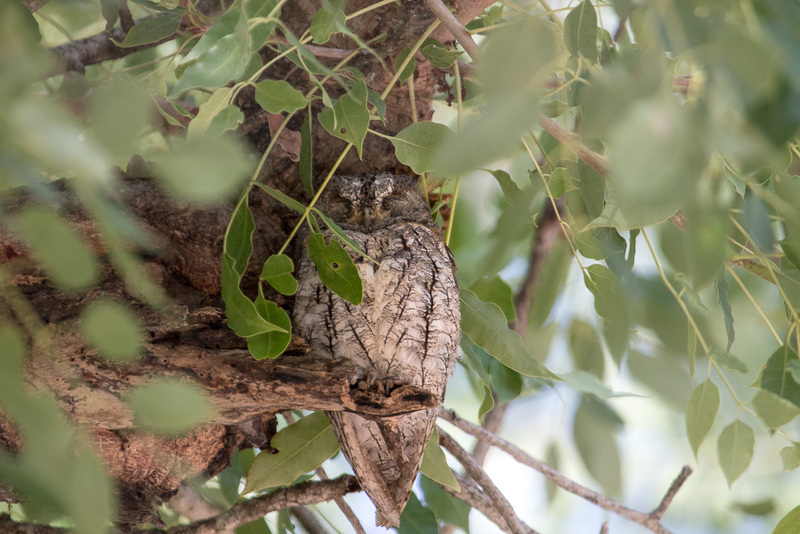 We reached a nearby picnic sight and were delighted to learn that the little resident scops owl (my favourite) was in visual, snoozing high up in the branches of a Marula tree. 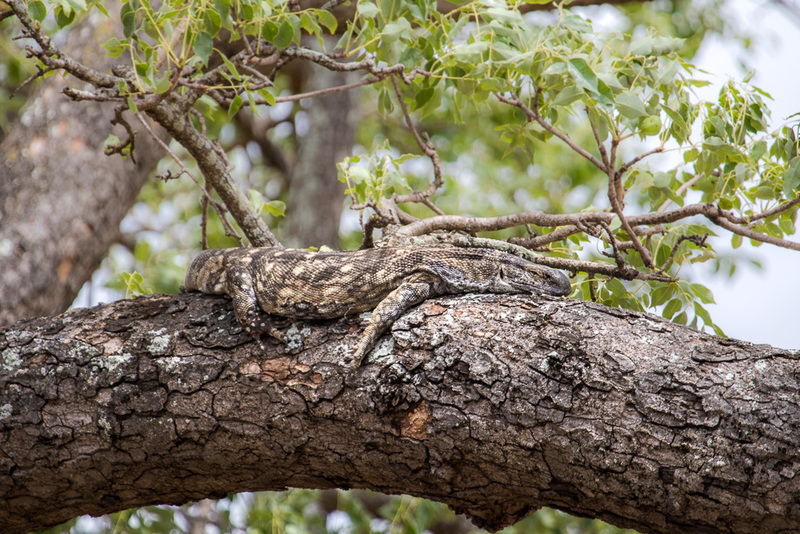 On our drive back to camp I spotted a leguaan sunning himself leopard style on the branch of a Marula tree. I think it’s safe to say that it was a fabulous morning for spotting interesting things concealed in the branches of Marula trees. Fabulous photos Robyn. Even though your camera card was full you certainly captured great pics of the leopard and the Scops Owl!!! Your “bush instincts” lead you to great viewing sites. 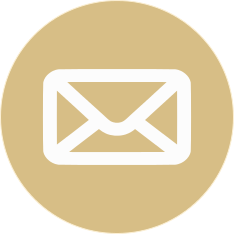 You should consider becoming a “private game guide”!!!!! Look forward to your next photographic sightings!!! !